29 Weeks! What the heck? So I had my 28 week appointment today. Or so I thought … *insert scary music* dun dun dun!!!!! My secondary midwife said that she was reading through my chart and looking at my ultrasounds and bloodwork and such and talked with my primary midwife after our visit three weeks ago. She said that she was concerned that we were operating with the wrong date in mind – she says that my growth has been more according to my “original” date of June 14 … so she and Anne agreed that it would be best to operate under the assumption that my “original” date is correct. So. I’m 29 weeks pregnant now instead of 28. That’s actually quite a big difference – at least it is in my mind! Not much is different for June Bug – he/she is still packing on the fat and apparently depositing a RIDICULOUS amount of calcium in his/her bones every day. Note to self: more calcium! So, 11 weeks is left, not 12. Eleven. Holy Cow. 12 weeks was three months … 11 weeks, not so much! I feel like we still have so much to do! Today Brad and I went to pick out the rest of the furniture for our bedroom set. We have it ordered and it should get delivered in 2 – 3 weeks, which is wonderful! I’m looking forward to having our room take shape and not look so thrown-together. We purchased a ‘door chest’ (randomly, Sears sells our set, and you can see this piece of furniture HERE), a six-drawered dresser, and two nightstands. Oh cool! You can actually see our bed HERE. Sorry. That was random! Regardless, I’m thrilled that we’ve bit (bitten?) the bullet and bought the set! Soggy lard bread … and a new toy! 27 Weeks! And a contest! Well, I made an appointment to see my midwife this morning to discuss work accommodation and what she thinks I should/should not be doing. She has written me a note that I am to go on ‘light duties’ (meaning no lifting over 10 lbs) as of April 15 – I’ll be 30 weeks along. That means that if my employer is not able to give me ‘light duties’ accommodation, April 15 will be my last day of work, and if they are able to accommodate me (my manager said yesterday that they *should* have two weeks of 22.5 hours of paperwork), I will be going off at the end of April. It’s earlier than planned, but really, with my manual labour job, it would be difficult for me to work until we had planned. The plan (to do data entry for April and May) was lovely, but this one will work too. And this way I get to focus on studying for my RNs, exercising, and getting ready for June Bug’s arrival! Well, I know it’s a couple days late, but better late than never! 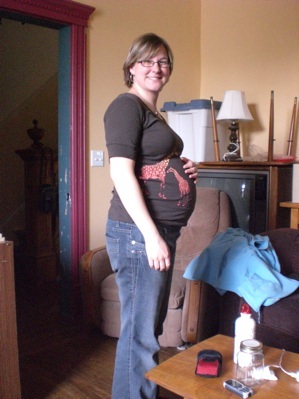 I was 26 weeks on Friday. June Bug is now 13 inches from head to toe and weighs very close to 2 lbs. He/she can (apparently) move in beat to music – although we haven’t tried this yet – and will soon open his/her eyes and respond to light! I can’t believe how big our baby’s getting!! Our Blessed Arrows is having a CLOTH DIAPER GIVEAWAY this week!!! The package includes 12 unbleached prefolds, one snappi, two diaper pins, three deodorizing pucks, and a pack of 15 flannel wipes. Can I say how excited I am at the idea of winning this giveaway??!? June Bug is *definitely* going to be a cloth diapered baby!! Check out the link to find out how you can sign up!